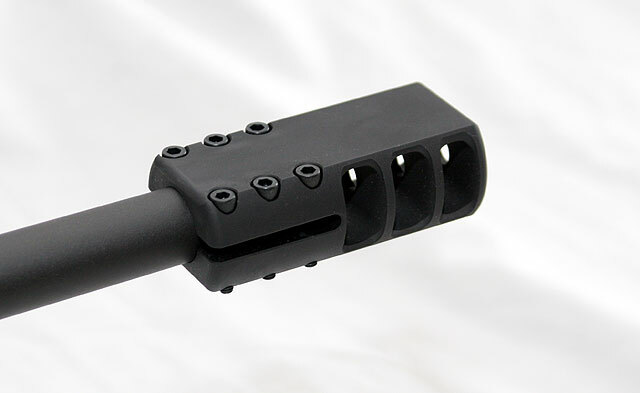 There are a number of clamp on style muzzlebrakes out there on the market and we wanted to put together a page that has just short reviews of each of the ones that we have come in contact with. This page will continue to be updated as we try out different brakes as they pass through our doors. The advantage of a clamp-on brake is that there is no need to do any additional machine work on the rifle. No need to thread the barrel, just clamp on the brake and use it. This allows anyone to do the work without having to pay a gunsmith. They typically need to be larger than a normal muzzlebrake and they may not have as nice of an overall finished look, but they do offer an alternative. The Roedale Precision clamp-on muzzlebrake was one of the early clamp-on brakes on the market. Roedale indicates that they developed it with the University of Applied Science Osnabruck/Germany. They utilize a two chamber design with the chambers angled back. They are made out of steel and are made in a few different sizes to fit some of the common heavy barrel diameters that are out there. We mounted one to a Remington heavy barrel rifle in .308 Winchester and mounting it was simple with a good fit. There are four larger bolts with allen head screws to tighten it down onto the barrel. The quality of the Roedale unit is very high and design has a flat bottom with the chambers open on top which reduces any dust kick up when firing as well as helping reduce muzzle rise. We do not have a way of measuring the effectiveness of the recoil reduction but we estimated there was about a 50% reduction in felt recoil. 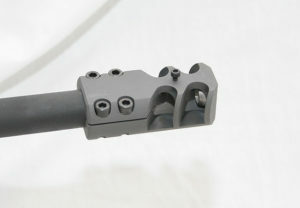 Overall the quality and effectiveness of the Roedale brake is very high and the size is actually not that large either. Of all the clamp-on units we have used so far this would have to be deemed the highest quality so far. The only downside is the price. After the Euro to Dollar conversion they end up running $200+ USD. 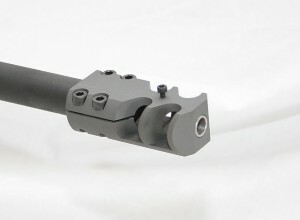 The Kahntrol Solutions clamp-on muzzlebrake is fairly new, coming out in late 2011 and are made here in the USA. This design is a three chamber design with the chambers being perpendicular to the bore instead of angled back toward the shooter like on the Roedale. They are available in several different sizes to fit various barrel diameters and they are also available in different finishes. The kahntrol brake is constructed out of aluminum and is hard coat anodized for a durable finish. They are mounted to the barrel using six allen head screws and the fit on a heavy barrel Remington was simple and straight forward. We mounted one on a 308 Winchester rifle to shoot side by side vs. the Roedale to make a comparison. The recoil reduction was not quite as effective as the Roedale and we would estimate that it reduces felt recoil by about 40%. The quality of the Kahntrol unit is good, though it does not seem to have some of the same engineering details as the Roedale and it is larger than the Roedale as well. But it is effective, easy to install and readily available to fit several different rifles. 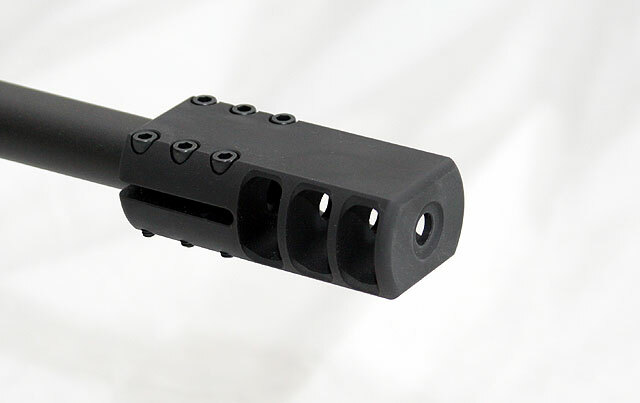 They are a good quality yet more affordable alternative for a no gunsmithing required muzzlebrake and typically run $150.